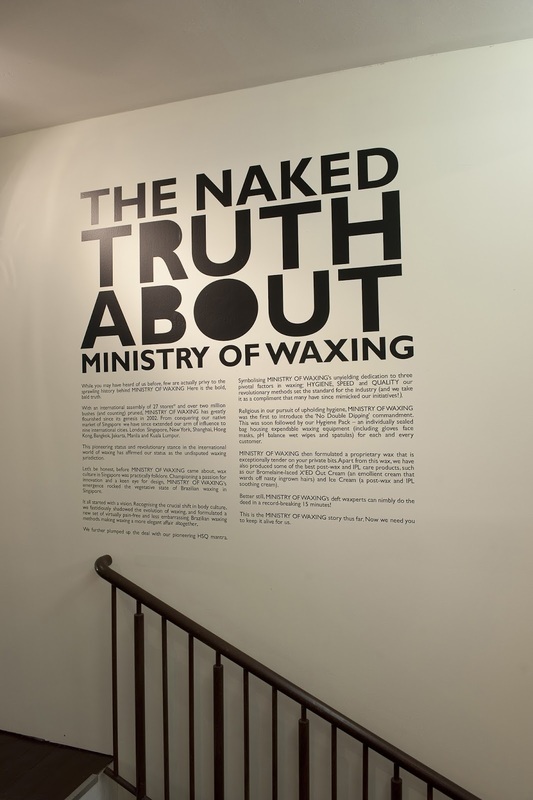 Waxing isn't exactly a well talked about topic in the blogger world, but I'm breaking that rule today after a recent trip to The Ministry of Waxing (MOW for short). Holed up in London’s Covent Garden, MOW offers every waxing service going for girls and boys, but their signature treatment is a Brazilian wax (Boyzilian for the boys). If you’re not familiar with a Brazilian, it involves having the hair in your ‘personal area’ removed using hot wax, to varying degrees of baldness (there’s really no other way to describe this!). One of the treatment rooms - you can see the cute stress monkey on the bed. MOW is a bit different from your usual beauty salon – instead of being greeted with pan pipes and herbal teas, the salon is bright, with exposed brickwork and plays house music. You feel more like you’re entering a well-lit night club than a beauty parlour. The treatment rooms follow the same design – very functional, but completely non fluffy. I think this is great as it makes it much more accessible to both sexes. For my treatment, I was lead downstairs to a treatment room by my therapist, who explained the process. I was to put my belongings in the room locker, strip off from the waist down, give the area to be waxed a quite swipe with the individual hygiene wipe provided and then hop up on the bed. They leave the room while you get ready, so although in the next few minutes the therapist IS going to be getting up close and personal with your personals, you do feel like you have some privacy. Hygeine is top priority at MOW and all of the therapists wear gloves, face masks and use a fresh wooden stick every single time the chocolatey wax gets dipped. No double dipping here! They also provide a cute little squeezy stress toy for you while you're having your treatment to help take your mind off any pain. Mine was in the shape of a hairy monkey - something they don't want you to leave looking like! Moving onto the pain. This is the most painless lady wax I have ever had in my life. Seriously. Yes, there was a little bit of stinging, but nothing like the usual pain! The therapists are extremely skilled (they do up to 16 brazilians a day), but I think it also comes down to the type of wax they use. Instead of using traditional hot wax that's removed using cotton strips, they use their own blend of wax which is left to cool and then peeled off. It doesn't stick to the skin, just your hairs, meaning much less pain (yay!). Waxing at MOW doesn't come cheap - prices range between £19 and £50, but you know what, I'm a total convert and will be heading back regularly. They have 2 branches in central London and are hoping to open a third very soon. You can find all the details and prices online at the Ministry of Waxing website. Will you be heading to the MOW? *My appointment was kindly provided for review, but I will be heading back there soon myself! I will have to check them out too! It makes mugger happy you refered to it as lady garden, Im not the only one! Ooh I'm afraid I am not tempted to cheat on the lady who does my waxing. It's such a personal kind of treatment that I can only trust the same person to do. I hope you have the choice of requesting the same beauty therapist! Also my lady makes me use an ice cube to numb the area down below which really helps with the pain factor. I enjoyed reading your review and it's good to know there are more choices for waxing available. Like a hairdresser it's down to personal choice. This sounds amazing, I would much prefer the house music to airy fairy stuff!